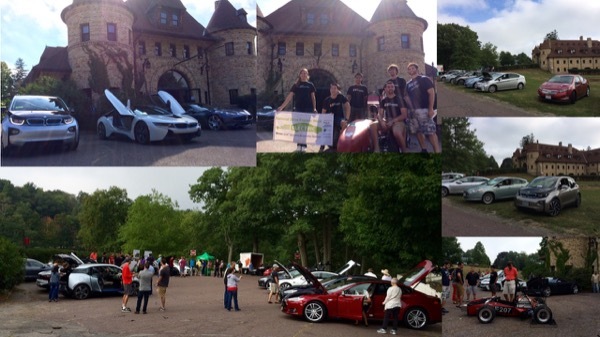 Over 100 EV drivers and spectators brought their enthusiasm and 35 vehicles to the historic Larz Anderson Auto Museum for EV Day this year. 20 different makes and models demonstrated some of the many ways to drive oil free and help the environment. Curious about Driving Electric? EV Enthusiast? If so, help us celebrate 2015 National Drive Electric Week at Electric Vehicle Day in Brookline, MA. On Saturday, September 19, 2015 from 8:30-10:30am, come see how people like you are driving Oil Free. Speak with new and experienced owners of electric vehicles and see dozens of different examples of electric transportation side by side. Bring your questions or your own electric vehicle and share the enthusiasm for the morning at the historic Larz Anderson Auto Museum. National Drive Electric Week, celebrating its fifth anniversary this year, is based on the idea that nothing beats learning the ropes from existing owners and ride-and-drives in clean, quiet and powerful plug-in vehicles for converting gasoline-car drivers to EV owners. The event showcases the cost-savings, clean-air benefits and fun of plug-ins. Plug In America, the Sierra Club and the Electric Auto Association team up with local groups to organize events, which feature all-electric and plug-in hybrid electric cars from every automaker on the market. EV Day will be an informal version of other themed lawn events held on the Larz Anderson Auto Museum grounds where attendees and owners will have the opportunity to show their vehicles and see a wide range of conversions and new production models available on the market. Open to any 2-4 wheel conversion, custom build or modern factory built plug-in electric vehicle. Admission is free for all, but we hope you will strongly consider supporting our host, with membership to the Larz Anderson Auto Museum, as well as the other sponsors of National Drive Electric Week - Plug In America, the Sierra Club and the Electric Auto Association. Registered attendees report 467,378 electric miles driven.